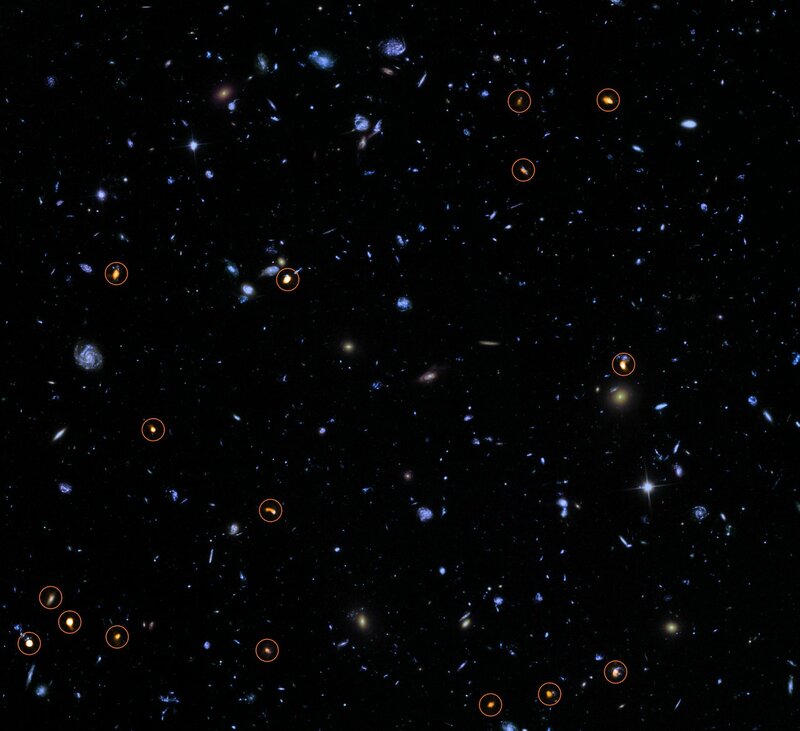  Astronomers specifically selected the area of study in the HUDF, a region of space in the faint southern constellation of Fornax (The Furnace), so ground-based telescopes in the southern hemisphere, like ALMA, could probe the region, expanding our knowledge about the very distant Universe. In this context “high mass” means galaxies with stellar masses greater than 20 billion times that of the Sun ( 2 × 1010 solar masses). For comparison, the Milky Way is a large galaxy and has a mass of around 100 billion solar masses. 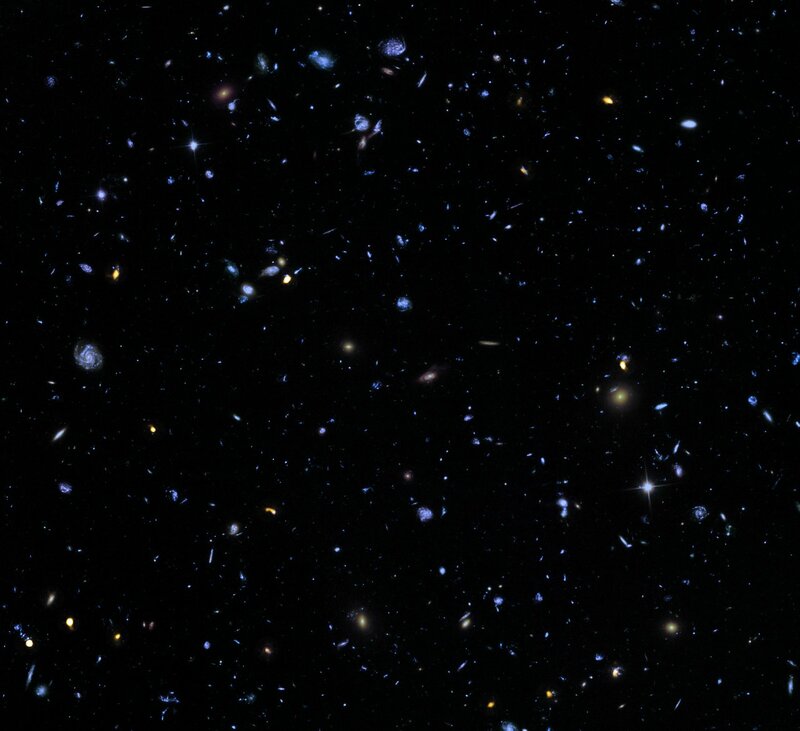 “A deep ALMA image of the Hubble Ultra Deep Field”, by J. Dunlop et al., to appear in the Monthly Notices of the Royal Astronomical Society. “The ALMA Spectroscopic Survey in the Hubble Ultra Deep Field: Search for the [CII] Line and Dust Emission in 6 < z < 8 Galaxies”, by M. Aravena et al., to appear in the Astrophysical Journal. 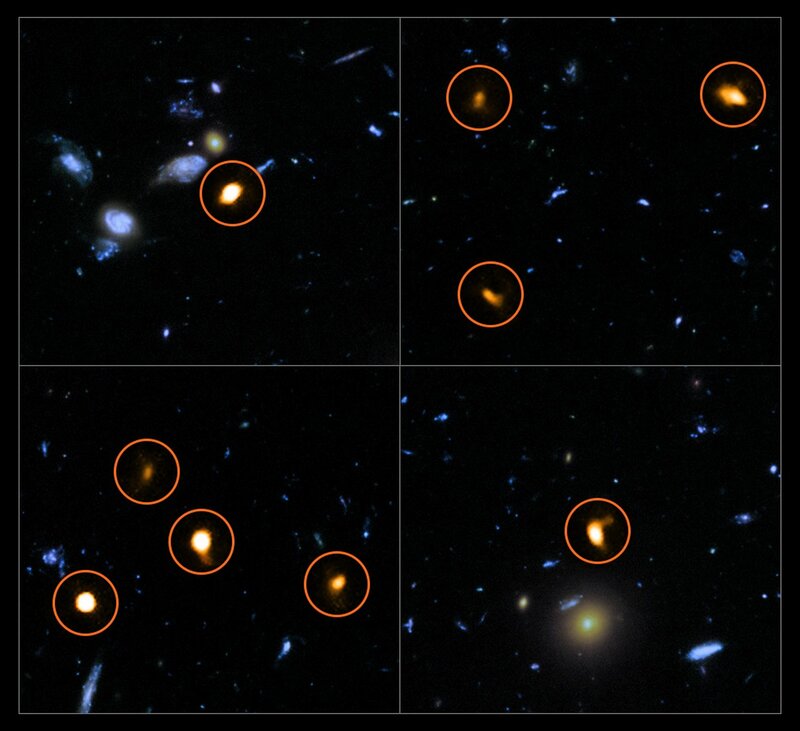 “The ALMA Spectroscopic Survey in the Hubble Ultra Deep Field: Molecular Gas Reservoirs in High-Redshift Galaxies”, by R. Decarli et al., to appear in the Astrophysical Journal. 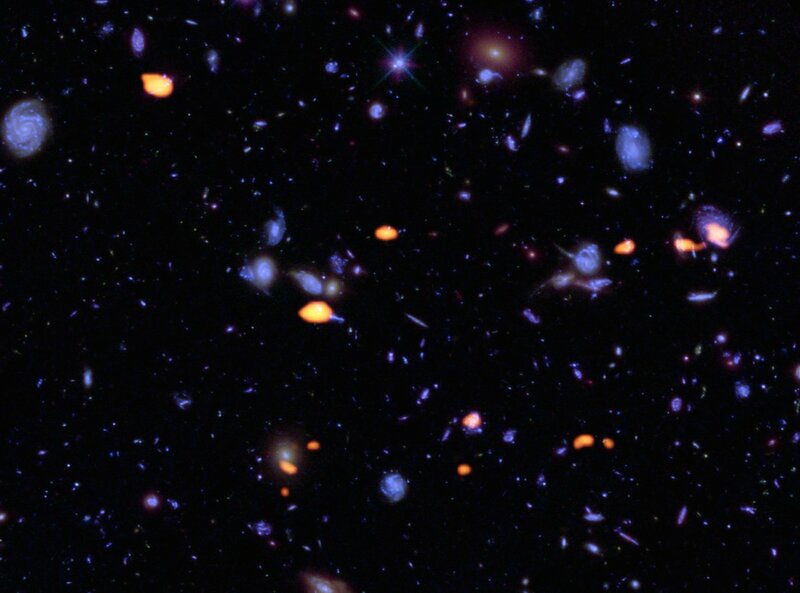 “The ALMA Spectroscopic Survey in the Hubble Ultra Deep Field: CO Luminosity Functions and the Evolution of the Cosmic Density of Molecular Gas”, by R. Decarli et al., to appear in the Astrophysical Journal. “The ALMA Spectroscopic Survey in the Hubble Ultra Deep Field: Continuum Number Counts, Resolved 1.2-mm Extragalactic Background, and Properties of the Faintest Dusty Star Forming Galaxies”, by M. Aravena et al., to appear in the Astrophysical Journal. 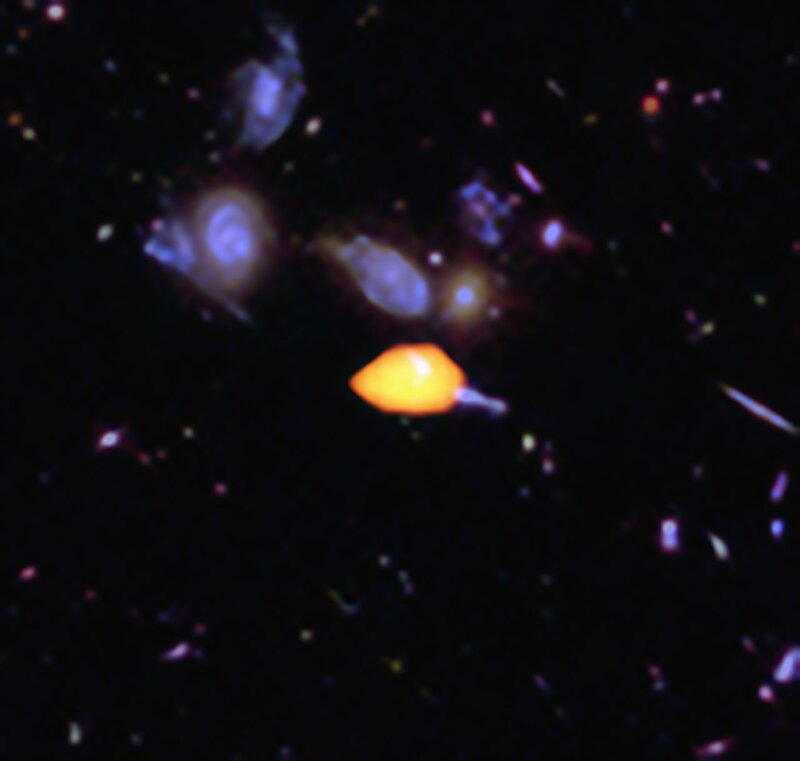 “The ALMA Spectroscopic Survey in the Hubble Ultra Deep Field: Survey Description”, by F. Walter et al., to appear in the Astrophysical Journal. “The ALMA Spectroscopic Survey in the Hubble Ultra Deep Field: the Infrared excess of UV-selected z= 2-10 Galaxies as a Function of UV-continuum Slope and Stellar Mass”, by R. Bouwens et al., to appear in the Astrophysical Journal. “The ALMA Spectroscopic Survey in the Hubble Ultra Deep Field: Implication for spectral line intensity mapping at millimeter wavelengths and CMB spectral distortions”, by C. L. Carilli et al. to appear in the Astrophysical Journal. K. Sheth (NASA Headquarters, Washington DC, USA), Roberto Neri (IRAM, Saint-Martin d’Hères, France), O. Le Fèvre (Aix Marseille Université, Laboratoire d’Astrophysique de Marseille, Marseille, France), M. Dickinson (Steward Observatory, University of Arizona, USA), R. Assef (Núcleo de Astronomía, Universidad Diego Portales, Santiago, Chile), I. Labbé (Leiden Observatory, Leiden University, Netherlands), S. Wilkins (Astronomy Centre, University of Sussex, Brighton, UK), J.S. Dunlop (University of Edinburgh, Royal Observatory, Edinburgh, United Kingdom), R.J. McLure (University of Edinburgh, Royal Observatory, Edinburgh, United Kingdom), A.D. Biggs (ESO, Garching, Germany), J.E. Geach (University of Hertfordshire, Hatfield, United Kingdom), M.J. Michałowski (University of Edinburgh, Royal Observatory, Edinburgh, United Kingdom), W. Rujopakarn (Chulalongkorn University, Bangkok, Thailand), E. van Kampen (ESO, Garching, Germany), A. Kirkpatrick (University of Massachusetts, Amherst, Massachusetts, USA), A. Pope (University of Massachusetts, Amherst, Massachusetts, USA), D. Scott (University of British Columbia, Vancouver, British Columbia, Canada), T.A. Targett (Sonoma State University, Rohnert Park, California, USA), I. Aretxaga (Instituto Nacional de Astrofísica, Optica y Electronica, Mexico), J.E. Austermann (NIST Quantum Devices Group, Boulder, Colorado, USA), P.N. Best (University of Edinburgh, Royal Observatory, Edinburgh, United Kingdom), V.A. Bruce (University of Edinburgh, Royal Observatory, Edinburgh, United Kingdom), E.L. Chapin (Herzberg Astronomy and Astrophysics, National Research Council Canada, Victoria, Canada), S. Charlot (Sorbonne Universités, UPMC-CNRS, UMR7095, Institut d’Astrophysique de Paris, Paris, France), M. Cirasuolo (ESO, Garching, Germany), K.E.K. Coppin (University of Hertfordshire, College Lane, Hatfield, United Kingdom), R.S. Ellis (ESO, Garching, Germany), S.L. Finkelstein (The University of Texas at Austin, Austin, Texas, USA), C.C. Hayward (California Institute of Technology, Pasadena, California, USA), D.H. Hughes (Instituto Nacional de Astrofísica, Optica y Electronica, Mexico), S. Khochfar (University of Edinburgh, Royal Observatory, Edinburgh, United Kingdom), M.P. Koprowski (University of Hertfordshire, College Lane, Hatfield, United Kingdom), D. Narayanan (Haverford College, Haverford, Pennsylvania, USA), C. Papovich (Texas A & M University, College Station, Texas, USA), J.A. Peacock (University of Edinburgh, Royal Observatory, Edinburgh, United Kingdom), B. Robertson (University of California, Santa Cruz, Santa Cruz, California, USA), T. Vernstrom (Dunlap Institute for Astronomy and Astrophysics, University of Toronto, Toronto, Ontario, Canada), G.W. Wilson (University of Massachusetts, Amherst, Massachusetts, USA) and M. Yun (University of Massachusetts, Amherst, Massachusetts, USA).